When it comes to our appearance, few things make us more sad than when we start to lose our hair. We have a solution to thinning hair using Stem Cell therapy. At first you might see small areas of thinning a receding hairline or perhaps a bald spot. Sadly, overtime those areas will begin to grow larger and eventually we will have to admit to ourselves we are losing our hair. Hair loss is common in both men and women. For men, this condition is known as male-pattern baldness. The pattern of hair loss in women differs from male-pattern baldness. For women, the hairline does not recede, but becomes thinner all over the head. Hair loss affects roughly 50 million men and in turn affects 30 million women in the United States. That translates to up to 40% of all women in America suffer from hair loss. Women’s hair loss isn’t talked about much, almost like it’s shameful, but thinning hair in women is extremely common. Women and men suffering from hair loss can expect to lose an average of 100 hairs per day, which is why we encourage treating the problem as soon as possible. Due to the prevalence of hair loss, there are a plethora of ways to supplement thinning hair. Specialty vitamins, radical diets, shampoos, creams and other add-ins are just some of the many popular non-invasive methods. These solutions, in our opinion simply don’t work – we have tried them all. There are also invasive methods such as hair transplant procedures and hair plugs. Unfortunately, these procedures only work half the time – and are extremely expensive. You will also have to continually repeat these procedures, as over time, your balding circumference will continue to widen. What a lot of people don’t know is that there is a successful minimally-invasive method available: Platelet-rich Fibrin Matrix uses your body’s own properties to boost hair growth. Platelet rich plasma (PRP) and specifically Platelet Rich Fibrin Matrix (PRFM) is a science, that combined with the right technology and our experience, delivers successful outcomes. It’s of the utmost importance to us that we lead with proven technology and science combined with our aesthetic eye to give you the best result. 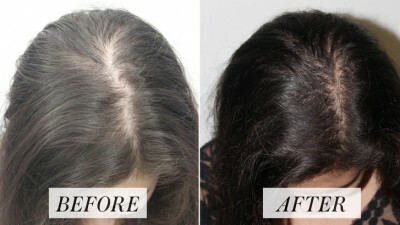 The success in clinical studies on PRFM’s efficacy in treating hair loss are undeniable. Coupled with the success we’ve found in our own practice, we are truly confident we at Injector 5280 in Denver can help you with your struggle with hair loss. What is PRFM for Hair Restoration? PRFM for hair restoration is a unique treatment in that it uses your body’s own platelets to restore hair growth. These platelets contain crucial growth factors which act like ‘repetitive signals’ to instruct your tissue to renew and multiply. PRP alone can help rejuvenate shrinking follicles, but the turbo charged PRFM version of PRP will take your results a step further. PRFM with the addition of Calcium Chloride, exposes your hair follicles to crucial growths factors for longer which stimulates your follicle to grow hair. Why Choose us for PRFM Hair Restoration Treatment? Working to stop hair loss, female hair loss in-particular, hits close to home for us. It’s important to us to use the right technology to stack the odds of a great result in your favor, it’s what we want for ourselves, and certainly for our patients! Losing a once full head of hair can be devastating, so if you are looking for a better alternative, call our office and find out how PRFM can help you regain your hair. How Does PRFM Treatment Work? PRFM treatment involves taking a small sample of your own blood then placing it into a centrifuge that will separate the blood from the plasma. This process allows us to specifically obtain Platelet Rich Fibrin (PRFM) with the addition of Calcium Chloride. The Platelet Rich Firbrin Matrix is then carefully placed into a syringe and injected directly in areas of thinning hair. These platelets obtained from your own blood, work to repair tissue, stimulate cell growth and increase collagen production encouraging new hair to grow. Topical anesthetic is applied to your scalp 30 minutes prior to treatment to help ensure comfort during the procedure. A small amount of blood is drawn from your arm under sterile conditions by one of our certified experienced technician’s or R.N.’s and placed in a special machine called a Centrifuge. Your blood is then spun to separate its vital components. The results of this step is called PRP (Platelet Rich Plasma) and is used for the PRP facial also knows as the Vampire Facial. However, to effectively treat thinning hair it is best to take an additional step. This additional step involves spinning your blood again combined with Calcium Chloride with specialized technology that separates out additional growth factors and stem cells resulting in Platelet Rich Fibrin Matrix (PRFM). PRFM is then safely placed into a syringe and injected into areas of thinning hair. What are the Benefits of PRFM for Hair Restoration? Which Areas can PRFM be Administered? PRFM is administered to stimulate natural hair growth in areas of thinning hair. It is important to note, when treating the hair, it’s crucial to treat areas of thinning hair, not just areas that are already completely void of hair (bald spots). How many PRFM Treatments will I Need? We encourage patients to do a minimum of 3-4 treatments every 30 days for optimal hair growth. It typically takes 3-6 months after the final injections to see full results so don’t worry if you don’t see results right away. After your initial treatments it’s important to maintain your hair growth by receiving an additional treatment every 3 months for the first year. After the first year, a treatment every 6 months is suggested for maintenance. This is the optimal standard for stimulating and importantly maintaining your hair growth. There is no cure for baldness, but consistent maintenance treatments of PRFM can significantly slow down the effects of hair loss – and make hair thicker. How much does PRFM Cost? Package pricing is available but the average cost per treatment is $650 – $800 depending on the area you’d like to treat. Does PRFM for Hair Restoration Hurt? Truthfully, a little bit but not bad! Everyone’s idea of pain is so different. The process itself is meticulous but typically the entire appointment takes roughly 30 to 60 minutes, depending on the area treated. Again, injecting into the scalp isn’t as painful as it sounds. Your comfort is of utmost importance to us so we will do everything we can to ensure your comfort, which includes applying a topical numbing agent 30 minutes prior to treatment. How long before I see Results of PRFM for Hair Restoration? We bring you back to the office for an evaluation 3 months following your first treatment. Generally, change is a seen and felt around the 3 month mark. However, some people see it sooner and some people a bit after. The first signs of hair rejuvenation include less shedding, increased length of hair, new hair growth and better hair density. Should have a Consultation first? At our practice we always offer complimentary consultations. It’s ideal to do a consultation first as we want our patients to know exactly what they are signing up for, not only from an outcome point of view but an investment point of view. We want you to be confident in your investment, in the treatment and importantly in us. We also want to make sure you are a good candidate for the procedure and we can deliver impressive results. Am I an ideal Candidate for Hair Restoration using PRFM? PRFM treatments are beneficial for any healthy person experiencing hair loss between the ages of 18–75 . With that said, there are some people who present with a better chance than others of achieving hair growth. Generally, if someone has very little or next to no hair in a given area, that particular area will be harder to get to respond. Catching hair loss while you still have roughly 20% or more of your own hair in a given area is ideal for PRFM efficacy. What are the Risks of PRFM? There are no significant risks associated with PRFM. Bruising can occur and usually resolves quickly in 5-7 days. Your scalp might be a little itchy and feel sore and swollen at the injection sites, which also resolves within the first week. Since it’s your own blood being re-injected the chance for infection or allergic reaction is nominal. Why is PRFM a great option for Hair Growth? Not only is PRFM backed by a large number of scientifically based articles but with PRFM no one will know you’ve done anything and the growth will come in naturally. With a hair transplant, you’re always trying to catch up to where the hair transplant was performed and then subsequently more hair loss occurs. PRFM provides efficacy in increasing hair count, hair thickness, and extending the growth phase of the actual hair cycle. PRFM is not surgery, so you’re not shaving any portion of your head, you’re not hoping for accurate placement or even if the follicle will actually take hold and proliferate. With PRFM you’re using the power of your own body to achieve hair growth naturally. Are all PRP/PRFM Techniques and Treatments Created Equal? No they most certainly are not. Hair restoration using PRP is outdated – you won’t be maximizing your investment and worse yet, compromising your result. Think of PRFM as the next generation of PRP. PRFM is a newer technology which stands for Platelet-rich Fibrin Matrix and requires a skilled practitioner like a Registered Nurse. PRFM ensures your preparation to achieve hair growth is as pure as possible – with other methods you may be causing the opposite of the desired effect. To achieve successful hair growth, we recommend choosing the proven PRFM technology, administered by one of our highly skilled practitioners at Injector 5280. Please read this Study on the Efficacy of Platelet-rich Fibrin Matrix in Hair Follicular Unit Transplantation in Androgenetic Alopecia Patients, conducted by the Journal of Aesthetic and Clinical Dermatology. The study investigates hair growth and PRFM’s efficacy in treating hair loss. The study concludes there were combined cases on the efficacy of PRFM treatment on patients with androgenetic alopecia – and most importantly showed improvements in hair follicle counts.